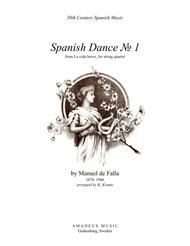 Composed by M. de Falla (1876-1946). Arranged by K. Krantz. For String Quartet. 20th Century. Advanced. Individual Part,Score,Set of Parts. Published by Amadeus Music (S0.39351).